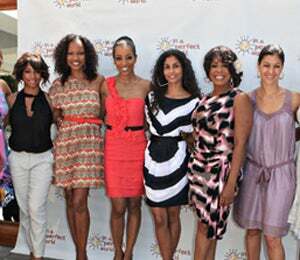 In a Perfect World organization and author Shaun Robinson co-hosted the first annual "I Am Perfect" brunch celebrating a group of exceptional teenage girls. In a Perfect World works to empower youth to become compassionate, socially-conscious, and responsible leaders. Garcelle Beauvais, Niecy Nash, and others were on-hand to share their personal life experiences and stories with these young sisters. In a Perfect World organization and author Shaun Robinson co-hosted the first annual “I Am Perfect” brunch celebrating a group of exceptional teenage girls. In a Perfect World works to empower youth to become compassionate, socially-conscious, and responsible leaders. Garcelle Beauvais, Niecy Nash, and others were on-hand to share their personal life experiences and stories with these young sisters.